We wanted to share that B~STEM Project is Inspiring Women Into Leadership. Lead Innovate is a dynamic 1-day leadership development workshop presented by CBS Entertainment Diversity. High school seniors. college level women and recent graduates workshop solutions to diversity & inclusion challenges along with their peers. The free workshop includes continental breakfast, panel discussion, project collaborations, professional mentoring, lunch, presentations, tech prizes, swag and happy hour networking (non-alcoholic) with industry executives. The program is scheduled 8 am - 5pm on Thursday, December 8th at CBS Studio Center, Studio City, CA. To register or for more information visit www.bstemproject.org. Space is limited. Hope you can join us! 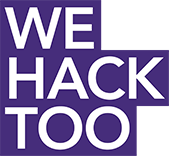 Also, stay tunned for infomation on WE HACK TOO 2017. In addition to the 48 hours vitual component, we're going to be in 10 major cities next year.